I know I offered to review this for Stu’s Shadow Independent Foreign Fiction Prize team, but having plodded through the first 51 pages of 664, it’s quite clear to me that I don’t like it at all, and so I’m not going to read the rest of it. Simon Schama at The Financial Times says it so much better than I ever could: whatever is the point? If you are disposed to try to understand the unfathomable Holocaust, this tawdry novel is not going to help you, and if it is the only book about the Holocaust that you read, its prurient violence may well put you off reading anything better. The nastiest thing about it is that by fictionalising the factual – the culpability of one Jew in the murder of his fellow citizens – it essays the notion that Jews helped to bring about their own destruction on themselves. And in a mere 50 pages it has managed to reinforce all kinds of anti-Semitic stereotypes; I refuse to read more of it. While hunting around for other reviews to compensate for this non-review of mine, I came across this brilliant essay by Dorian Stuber at the OpenLetterMonthly. It’s long, but it’s well worthwhile, especially if you’ve never read Primo Levi’s If This is a Man/The Truce. Check this one out too, by David Eggleton at the NZ Listener. Carmen Callili at The Guardian, makes the astonishing claim that she thinks Dickens would like it. Really? An author long dead before the Holocaust used to invoke praise for this novel, well, well. Is it because there are a lot of characters to keep track of? 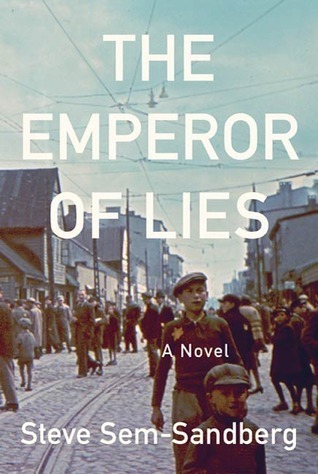 Daphne Merkin at the NY Times invokes Dickens as well, as if readers will find his unique comic sensibility in the characterisations of The Emperor of Lies too. Well, it is Dickens’ anniversary this year, and reviewers like to make good use of classics they’ve read, I suppose. This one at Jewaicious made me pause for thought. For other reviews by members of the Independent Foreign Fiction Prize team, click here. Do yourself a favour and read Inga Clendinnen’s masterly Reading the Holocaust instead. Not a winner, then, I hope! Was wondering about this one, but can’t access it via my library at the moment, but based on your review & attendant comments, it would appear that (a) I’m not missing much & (b) there are far better works on this subject already, would also agree with your Calvino remark. I’m just about to start From the Mouth of the Whale – now *that* should be good! Oh dear. I haven’t sourced this one yet, and I was hoping it might be a good one. It doesn’t sound it. Enjoy Sjon, though…! I’m 67 pages in, and am enchanted! Hmm. I understand your unease, though I’m not sure I’d go so far as to imply that a character as undeniably complex and contradictory as Rumkowski is not worthy of further exploration. I think Sem-Sandberg does enough to challenge the apparently commonly held assumption that Rumkowski’s motives were entirely self-serving, and he does raise the fascinating point (albeit in his afterword) that had the War ended six months earlier, the view of Rumkowski could now be quite different. All that said, I think the author undermines his work in that direction with the quite bizarre (and rather gratuitous) section about his adopted son; furthermore, not for the first time on this shortlist, this book is way, way, way too long. *chuckle* Definely too long for me! PS: Readers, you can read Mark’s review of this book by following the link in my post to the Shadow IFFP team’s combined reviews. I’m sorry I didn’t know you when you were reading for the IFFP shadow jury; I didn’t join until it’s last year, and of course now it’s become the MBIP. But, it’s good to share our thoughts about literature now, at least. I so appreciate your comment on my Bricks and Mortar post, as well as this post of yours. You may have called it a non-review, but to me it very clearly explains why this book is rubbish. I blog with Dorian Stuber and find him infinitely wise and well read; interesting that you cited an article of his here. I’m not overly familiar with OpenLettersMonthly, much to my chagrin. I hate to be so “prissy” (if that’s the right word, which I suspect isn’t), but someone has to stand for good and truth, relative as that might be. I like to think that on our own blogs we can say how we feel, and in the process find a kindred spirit. We agree: literature is important because (amongst other things) it has something to say about the human condition, and that involves questions of good and evil. I don’t want to read didactic literature, but equally so I don’t like books that wilfully distort our fragile understanding about what good and truth might be. I like reading professional reviews, but there is one thing we do better than they can. LitBloggers can be upfront about *not* reading a book, and explain why.